We are one of the leading Chinese companies who have specialised in the design and manufacture of Complete Wood Pellet Mill, Small Wood Pellet Line, Pellet Presses, Pellet Plant. 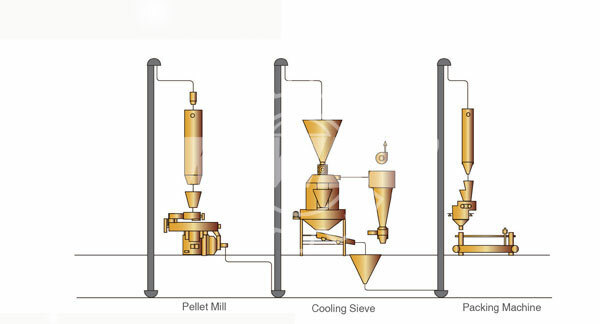 Pelletizing is the process of making waste materials into solid fuel. The pellets are then used for thermal combustion. Wood pellets are one of the most common products of pelletization. Wood pellets can be made from any type of agro-forestry waste: peanut shells, sugarcane bagasse, caster shells/stalks, sawdust, coffee husks, paddy straw, sunflower stalks, cotton stalks, tobacco waste, mustard stalks, jute waste, bamboo dust, tea waste, wheat straw, palm husks, soybean husks, coconut residues, rice husks, forestry waste, woodchips and other agro-wastes. The moisture content should be less than 15%, and grain size below 5*5 mm. The best moisture content for pelletizing is about 13-15%. Our rotary dryer can reduce the moisture content from 60% to 10%. The stove may be fueled by sawdust, waste wood, or coal which can save on electricity consumption. Our rotary dryer is specially designed to save energy. The outside of the dryer is covered with a special cotton material sheet to insulate heat. 1. The lubrication system for wood pellet mill adopts a tracing and inspection system controlled by a microcomputer. When the temperature of the bearings exceed normal temperatures, the microcomputer will start the auto-lubrication system for lubrication—thereby conveniently ensuring smooth functioning of the rollers. The lubrication system is comprised of a tracing and inspection system controlled by a microcomputer. There is also the option to lubricate by hand. 3. The ring die and roller of the wood pellet mill has been finely machined using alloyed steel. The heat treatment process is different from other domestic manufacturers in that the carburization treatment increases the depth of hard-facing to 2 mm which improves the anti-abrasion properties of the ring die and roller by a factor of ten. This greatly saves on replacement costs. After the pelletizing process, the temperature of the wood pellet is about 60-80 degrees Celsius, with a moisture content of about 15%.A Cooler must then be used to reduce the moisture content of the wood pellets to about 3-4%, thereby making the wood pellets easier to store. After cooling, the wood pellet must be protected from moisture and other environmental conditions. For this there is the packing process, which is effectively handled by our Semi-Auto Packing Machine. Generally, most clients require a small scale with the auto-sealing packing machine and a scale for higher weight ranges for the semi-auto packing machine. For the first, the weight range is 15-25 kgs per bag, and for the second, it is 800 or 1000 kgs, modified per clients’ needs. Note:In the operation of the complete wood pellet plant, the filtering of dust is a key concern.For this purpose we offer the Common Dust Collector (or cyclone) and the Impulse Dust Filter. For air exhaust systems, we provide the Water Film Dust Collector for the greatest dust-free environment in the process of drying and cooling—a highly dust-emitting process.